Join us in a coffee style conversation about favorite children’s books and the elements that make them shine. When the bell rings for recess, Micah and J.T. take turns choosing kids for their kickball teams. The best players get picked first. Then the best friends of the best players. Then the friends of the best friends. Only Brian is left, still waiting and hoping. I admit it: As a teacher, I sometimes lecture. I preach. I cajole. And in doing so, I risk losing my audience. 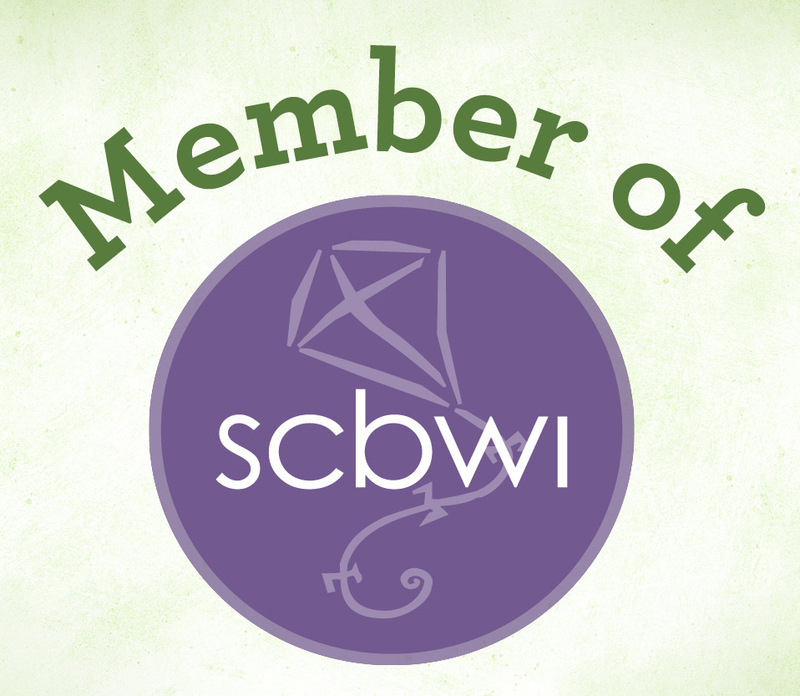 Trudy Ludwig, however, spins a sweet story to sneak in her lesson of inclusiveness. 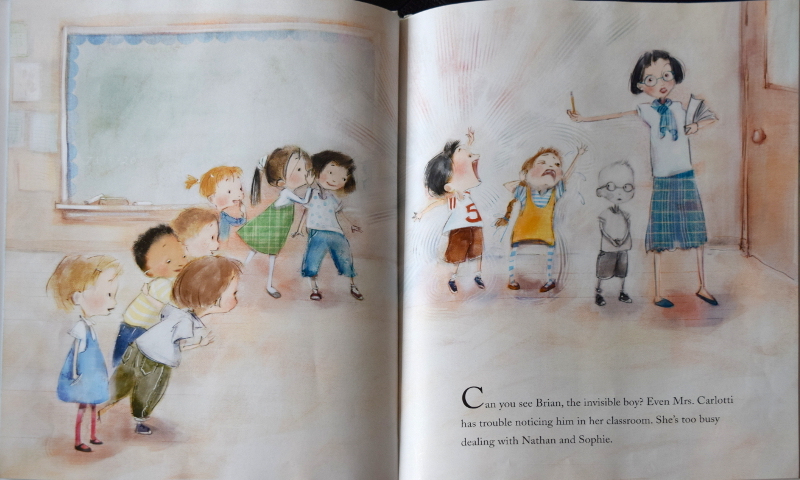 In The Invisible Boy, Brian always seems to fly under the radar: Never picked for group work, never invited to parties, never really noticed despite his artistic talent and friendliness. It takes a new student’s arrival to change the class dynamics so Brian finally stops being so—invisible. I’m normally a text-focused reviewer, but Patrice Barton’s illustrations really step up to enhance this story. 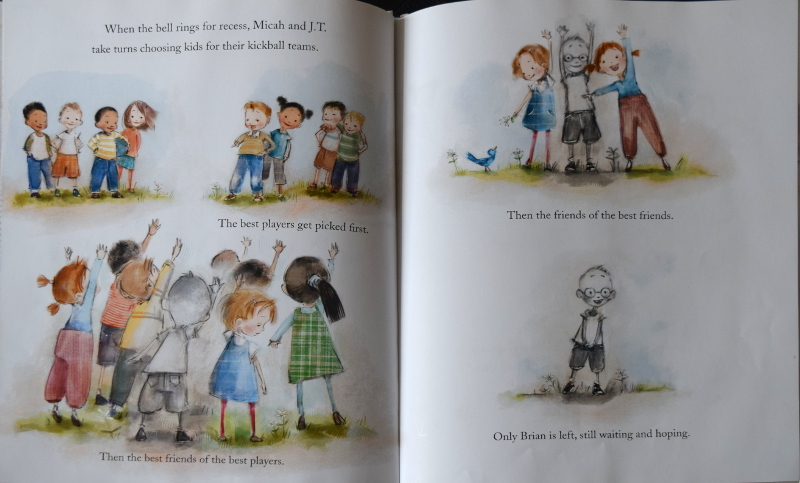 When Brian feels sidelined, he’s drawn in black and white, contrasting wonderfully next to his colorful classmates. Each time he’s actually noticed or interacts with others, color starts to blossom on his cheeks. It’s a simple but effective technique to catch our eye and evoke sympathy for Brian. The ending is that much more satisfying when we finally get to see Brian in full, blessed color like the other kids. Whether you’re hoping to teach inclusiveness, celebrate quiet talents, or just enjoy a story with heart, check out The Invisible Boy and feel your own color start to blossom. Brian looks at the floor, wishing he could draw a hole right there to swallow him up. Everyone wants to be noticed. That’s why Nathan talks in his outside voice, why Sophie is a drama queen, and why the teacher can’t see past Nathan and Sophie. All of them are competing to be heard. But Brian has a bigger problem. He’s too introverted to demand attention. He’s the invisible boy. Haven’t we all felt invisible? Author Tracy Ludwig offers a solution, but it requires a risk. This risk entails looking outside of ourselves. Ludwig reminds young readers, old readers, introverts, and extroverts that happiness is accessible when we share the good that is within. 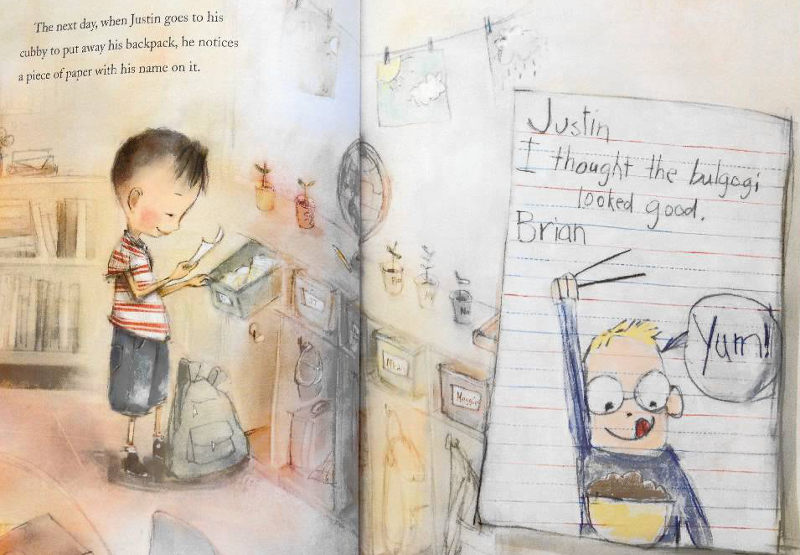 Illustrator Patrice Barton makes kids like Brian visible with humor and gentleness. Her images don’t reprimand, pity, or condescend. I like to imagine that her other tenderly-drawn characters, like those in Mine and I Like Old Clothes are the family members of Brian and his class–all on their own journey of acceptance. 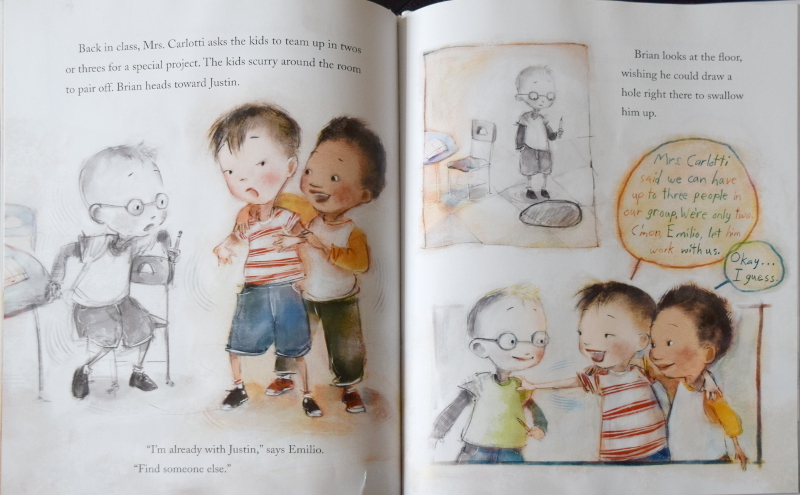 The Invisible Boy and Ludwig’s other psychologically smart stories, like Confessions of a Former Bully and Gifts From the Enemy offer creative resources to replace isolation, exclusion, and aggression with companionship, empathy, and kindness. Children love Ludwig and her stories, because she understands. Parents and teachers, and counselors love Ludwig and her stories, because she empowers. Who’s invisible in your life? Is it you? 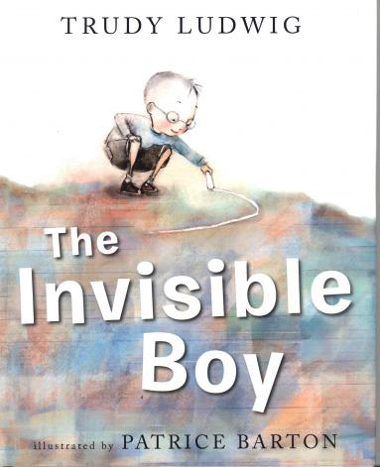 You’ll find a friend in The Invisible Boy. Watch for my gem next week! 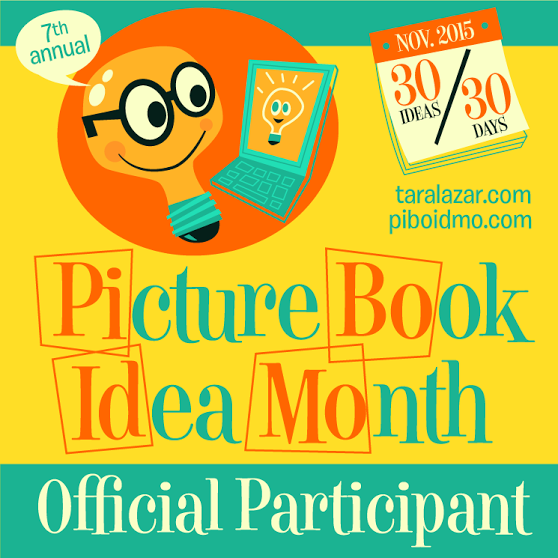 What empowering children’s book do you recommend?